Fairport, NY, USA -- Saelig Company, Inc., has introduced the GW Instek MDO-2000E Series Oscilloscopes which combine several test instruments in one enclosure. An actual spectrum analyzer is included in the design, not just an FFT calculation to display the frequency domain. The series includes two instrument combinations: MDO-2000EG and MDO-2000EX. MDO-2000EG models have a built-in true spectrum analyzer and a dual channel 25 MHz arbitrary waveform generator, while the MDO-2000EX models feature a built-in a true spectrum analyzer, an arbitrary waveform generator, a 5,000 count DMM, and a 5V/1A power supply. The first of its kind, MDO-2000EX is the only oscilloscope to provide a space-saving combination of spectrum analyzer, DMM and power supply, making it ideal for educational or space-restricted use. The MDO-2000E Series is available in three bandwidths: 70, 100 and 200 MHz and in 2 or 4 channel models. 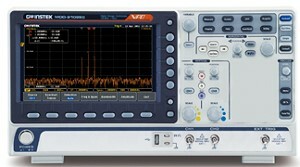 A conventional digital oscilloscope uses FFT calculations over the entire signal bandwidth up to half the sampling rate. But inadequate calculation capability means it is impossible to have a signal's detailed frequency information due to the insufficient frequency resolution from the calculation. In contrast, the MDO-2000E series analyzes just a defined signal spectrum of interest to allow engineers to effectively conduct precision signal measurements in the frequency domain. Users can input specific data of interest regarding the signal: center frequency, span, and start/stop frequency, similar to a traditional spectrum analyzer. While observing frequency domain display, engineers can observe waveform characteristics which are not easily seen from time domain waveforms, such as the harmonic composition of a waveform and the frequency characteristics of a modulation signal. Compared with an oscilloscope's FFT, the MDO-2000E series allows engineers to effectively conduct signal measurements both in the time and frequency domains. Offering an advantage over conventional spectrum analyzers, the spectrum function of MDO-2000E series can test signals that are below 9 kHz, such as audio and vibration signals. The MDO-2000E series can also test signals that have a DC component without damaging the instrument. The MDO-2000E series offers the same capabilities as real-time spectrum analyzers, but faster than frequency sweeping. This is because the MDO-2000E series utilizes advanced digital circuitry and software to render the frequency display. Ordinary spectrum analyzers process narrow frequency bandwidths which are frequency swept over time. Thousands of frequency sweeps are collected to form a spectrum. The FFT settings of ordinary digital oscilloscopes are dependent on the horizontal scale or sample rate setting, which is totally different from the frequency range setting of the MDO-2000E series. Most DSOs will have insufficient frequency resolution. Made by the Taiwanese test and measurement specialists GWInstek, the MDO-2000E oscilloscope series are available now from Saelig Company Inc. For detailed specifications, free technical assistance, or additional information, please contact Saelig (585) 385-1750, via email: info@saelig.com, or by visiting www.saelig.com. Founded in 1988 in Rochester, New York, Saelig is a North American distributor with a growing reputation for finding and sourcing unique, easy-to-use control and instrumentation products and related active components, for use in a variety of industries. Products lines are continuously added from sources across the globe, and are offered at highly competitive prices, accompanied by full in-house technical support, exceptional customer service, and fast delivery. For full details of available product lines, please visit www.saelig.com.